Many musicians help QP create the different musical settings of our weekend Masses. All ages may participate in the pew or in volunteer capacities. Join us in song; consider the many ways you can help praise God through music! Lead the assembly in song during daily or weekend Masses. Open to all parishioners high school age and older. This contemporary group is open to instrumentalists and singers high school age and older. High school, college, and young adults bring their musical gifts to the 7:00 p.m. Mass one Saturday a month. The children’s choir encourages second graders and older to get involved in music. 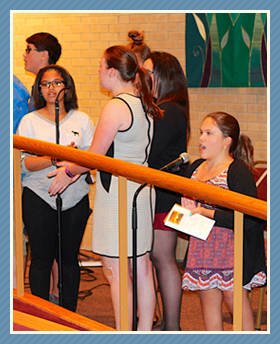 This choir provides 5th-7th graders the opportunity to participate in singing contemporary music at Mass. Both adults and youth come together to perform beautiful music on four octaves of Schulmerich handbells. The handbell choir plays monthly at various Masses. Support and comfort the grieving through song at funerals.